The 2013 Cadillac SRX is a five-passenger midsize luxury crossover that gets an almost completely new interior this year, after receiving a new engine for the 2012 model year. Competition in this class is tough, including the Lexus RX, the Mercedes-Benz M-Class and the Infiniti FX. But the 2013 Cadillac SRX seems more than up to the task. New this year is the addition of the Cadillac CUE infotainment system to the SRX lineup. While there's certainly no doubt that the 2013 SRX is a Cadillac, looking at it from the exterior, the automotive press comes out highly in favor of the revamped interior. Some go so far as to call it "luxury in the extreme." Translate that to mean just the right amount of high-quality and attention to detail, not bling or gaudiness or ostentatiousness. Car and Driver is quick to point out some of the 2013 Cadillac SRX strong points: "whisper quiet, contemporary interior styling, lots of technology, luxurious appointments, strong standard V-6." However, unimpressive fuel economy rates a ding, as does the "unsexy" engine sound at full throttle and "clunky" exterior proportions. A review in Cars.com hails the 2013 Cadillac SRX for its great family friendly sense and style, and "good times" with respect to the fun-factor. Storage compartments and cargo space are deemed ample. While the editors at Consumer Reports tout the agile handling and taut yet supple ride in the SRX, they're not so enthused about the SUV's "snug" second-row seats, wide roof pillars restricting rear visibility, convoluted CUE system, and "sluggish and underpowered" feel, particularly in everyday driving. This is despite generous horsepower ratings. Other pluses include the quiet cabin, high-quality interior and supportive front seats. In general, owners have a lot to like about the 2013 Cadillac SRX they purchased. Commenting on such sites as AOL Autos, Edmunds, Cars.com and Kelley Blue Book, these seem to be more than fairly well satisfied owners. Highlights of the compliments include: comfortable, "all the features I like, "love that scheduled maintenance is included, "wonderful suspension that hugs the road like sportier cars," and the AWD Performance model is "smooth and responsive, even towing a low-boy trailer." Numerous owners remarked that the SRX has a stunning appearance, boasts outstanding quality and is a joy to drive, offering plenty of power and reasonable fuel economy. Specific likes include the CUE infotainment system and navigation features, as well as the cut and sew interior. Among all the accolades, however, a few complaints stood out, namely regarding the transmission, which a couple of owner said was "jerky" and "erratic." 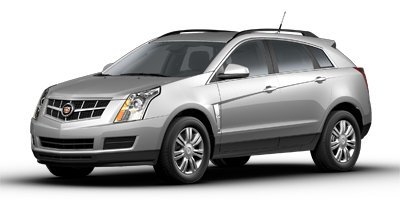 The 2013 Cadillac SRX is available in Base, Luxury, Performance and Premium trims. As with most Cadillac models, the base SRX is anything but budget. Even the vinyl upholstery has a "leatherette" look and feel to it. Included as standard are keyless entry, dual-zone automatic climate control, and an eight-speaker Bose audio system with dual USB inputs and Bluetooth streaming. Next up is the Luxury trim, which ads power-adjustable pedals, keyless entry/ignition, remote engine start, leather seating, driver-seat memory, heated steering wheel, power UltraView sunroof, rain-sensing wipers, power liftgate, rearview camera and blind-zone monitoring. Buyers of the Performance trim gain more luxury feature, such as an upgraded audio system, steering-linked adaptive xenon headlights, and a navigation system. All-wheel drive versions include another performance upgrade with sport suspension with automatic damper control. The top-of-the-line Premium trim boasts heated and ventilated front seats, heated rear seats, tri-zone automatic climate control with separate rear controls, a 10-speaker Bose audio system, and the Driver Awareness Package with features like lane-departure warning. With all-wheel drive, the Premium rim also gets a sport suspension. Options vary by trim and include a dual-screen rear entertainment system with wireless headphones, the Driver Awareness Package, a Trailering option and an available pet cargo partition. Among the motoring press, the general consensus is that the 2013 Cadillac SRX provides a capable and competent driving experience. While not as nimble, perhaps, or even as quick as a BMW X3, the SRX does give the driver a nice balance between agility and comfort. The steering system, say the auto critics, helps the SRX feel sporty and offers good feedback from the road. Powering the 2013 Cadillac SRX is a single 308-horsepower direct-injection 3.6-liter V6 engine paired with a five-speed automatic transmission, both of which were new in 2012. The engine is also flex-fuel capable, meaning it can run on a gasoline/ethanol blend. Base versions are front-wheel drive only. All-wheel drive is optional on Luxury, Premium and Performance models. EPA-estimated fuel economy with this combination is 17 mpg city/24 mg highway (front-wheel drive, gasoline) and 12/18 mpg (E85 ethanol). With all-wheel drive, the numbers are 16/23 mpg (gasoline) and 12/17 mpg (E85). The 2013 Cadillac SRX can tow a maximum of 3,500 pounds. The 2013 Cadillac SRX, say the automotive reviewers, really shows its stuff on the inside, treating occupants to a uniquely Cadillac interior, from the details to the overall design. Hand-cut-and-sewn coverings on the instrument panel and ambient lighting contribute to the richness of the environment. Depending on which auto reviewer, opinions are divided on the Cadillac User Experience (the CUE system). CUE comes standard on the 2013 Cadillac SRX and features an eight-inch touchscreen capable of syncing with up to 10 wireless devices. The haptic screen, like tablets and smartphones and screens used on crime shows like Hawaii Five-0, recognizes pinch and spread gestures and hand swipes. In essence, the CUE is a command station for all audio, phone, climate and navigation needs. The addition of active noise cancellation for 2013 makes the interior whisper-quiet. In essence, a microphone detects ambient noise and the computer counteracts the sound waves through the audio system. Many reviewers are impressed with the versatility of the SRX's cargo area, which is considered large and provides numerous storage options. Cargo volume is 61.1 cubic feet with the rear seats folded and 29.9 cubic feet when they're in use. As expected in a luxury crossover, the 2013 Cadillac SRX is well-equipped with numerous standard and available high-tech safety features. Standard safety equipment includes four-wheel ventilated disc brakes (the system also includes Brake Assist, Ready Brake Alert and Hill Start), electronic stability control, all-speed traction control, front-seat side airbags, side-curtain airbags, daytime running lights, and OnStar roadside and emergency assistance. Safety features included in Premium version and optional on Luxury and performance are a few making their first appearance on the SRX, including forward collision warning, lane-departure warning, and GM's new Safety Alert Seat that vibrates to warn the driver of potential collisions. Standard on Luxury, Performance and Premium (but not available on Base) are blind-spot alert and rear cross-traffic alert. And an available adaptive headlight system helps illuminate around dark corners. In government crash testing, the 2013 Cadillac SRX earned a five-star overall rating from the National Highway Traffic Safety Administration (NHTSA). Within the five-star overall NHTSA rating is four stars each in frontal and rollover testing and five stars in side crash testing. The Insurance Institute for Highway Safety (IIHS) gave the SRX its top "Good" rating in frontal-offset, side, and roof strength crash tests and named it a Top Safety Pick. As for reliability, in the J.D. Power and Associates Predicted Reliability Score, the 2013 Cadillac SRX earned a three Power Circle rating, where three is about average. Consumer Reports, on the other hand, says that reliability for the 2013 Cadillac SRX remains below average. Interested to see how the 2013 Cadillac SRX ranks against similar cars in terms of key attributes? Here are the 2013 Cadillac SRX rankings for MPG, horsepower, torque, leg room, head room, shoulder room, hip room and so forth.